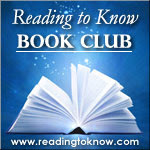 This month Amy from Hope is the Word is hosting the Reading to Know Book Club. 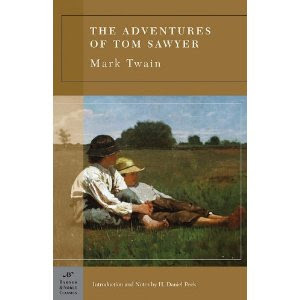 She selected The Adventures of Tom Sawyer , by Mark Twain for this month's read. If you've never read this one before, now's a great time to get that taken care of! We hope you'll join in. You have until Friday, May 25th to read and post your thoughts on this classic. Since I have really been trying to make my own stacks a priority, I think I am participating, but listening to Tom, if that's okay. I'm kinda snickering because I've never much been a fan of Tom or Huck either! But I also haven't read either since high school so I'm going to give this one another go and see if my opinion changes. The kids and I are having a great time reading this together. I've got this one beside me right now. Even if I had to skim one, I got all of my review books out of the way(for now), so I think I'm going to start reading it in a little while. I might not participate in this one, but I am excited to learn there are others who aren't fans. I thought I was some sort of American traitor for not loving Tom and Huck! I feel like a burden has been lifted from my shoulders. Can I count reading it in 8th grade? Oh, wait...it was Huckleberry Finn and it was fun because our quite dramatic teacher read it aloud to us as we followed along in our books. She substituted the word "slave" for the "n" word which I thought was nice. It was entertaining....but I don't think I want to go back and revisit it. Oh, I saw the play, too, in jr. high so I'm going to count that! Gasp! Book lovers who don't love Tom and Huck?! I think I'll read it again just for fun. Wonder how many times this will make. . .10? 12? ?